The easy elegance of our in-house restaurant provides the perfect backdrop for the finest seasonal food. High ceilings and spacious surroundings encourage you to enjoy a relaxed dinner served with style perfectly accompanied by our extensive wine list. The traditional Full English Breakfast is also a must, as is the Vegetarian version (pictured below). 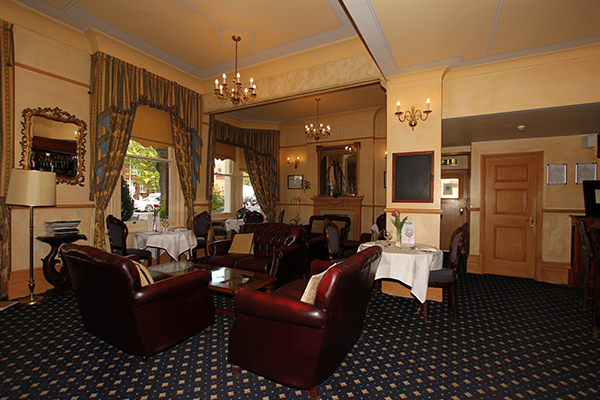 Breakfast is served between 7:00am and 9:00am weekdays, 8:00am and 10:00am at weekends and bank holidays. If the Full English is too indulgent to start your day, we also offer a lighter Continental Breakfast. Our traditional, three-course Sunday Roast is an absolute favourite – you’ll be pleased to know that it comes with a variety of seasonal vegetables, crispy roast potatoes and slow-roasted meats. Our delicious, classic afternoon teas are served from 2:00pm to 6:00pm, in either the Restaurant or The Club Room – so, if you fancy the tasty and sweet treat of dainty sandwiches and finger cakes, all to the sound of clinking china, with the afternoon sun spilling across fine white linen cloths, come and join us! Open from 11:00am till late serving a wide range of drinks and aperitifs. Our Bar Menu serves a range of classics and is available from Midday to 9.30 pm.